Before talking about Team, let’s take a look at some significant definitions. Team is a group of team members and clients united to work with the same objects (dashboards, saved charts, presentations, datasets and integrations) – which can be administered and billed together. This is useful if you are a company that has many dashboards and need to give others in your company, or your clients, access to the dashboards and data. Owner is a person who has created the Team. Team member is an internal user (colleague, company member) who is invited to the Team. Client is an external user who is invited to the Team. Group is a folder that can be created on the Team members or Clients tabs in order to structure members of the Team. Your Team is created by default when you register with Slemma. Once you are registered, you can then add team members and clients to your Team. 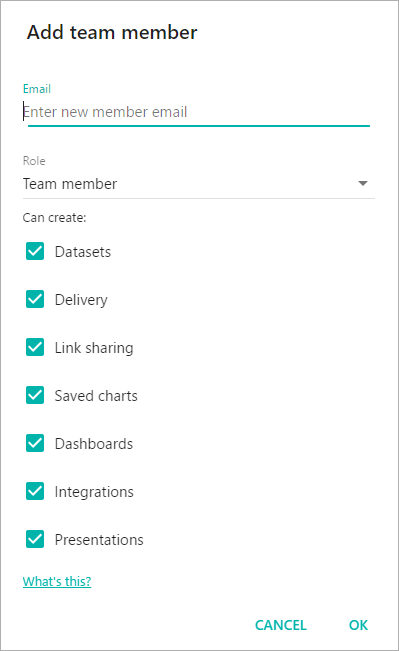 To invite team members to your Team, from the navigation pane, head over to the Admin page > Team members tab, click on the big plus button at the bottom right corner, and choose Add new team member. Type in email of a team member (which you want to invite). Choose a group where you want to place the team member (optional). Assign a role to the team member (Team member, Team member group admin or Administrator). Specify which objects the team member will be able to create (by default all possible objects are selected). Each team member will get an invite email. If they don’t have a Personal account yet, Slemma will create one. This is required to become a member of the Team. NOTE: The number of team members that you can invite to your Team is limited by your Plan. The whole list of team members is always displayed on the Team members tab. The Administrators group is a permanent group created by default, which contains team members with the admins role. To create a new group, click on the big plus button at the bottom right corner and choose Create new team member group. 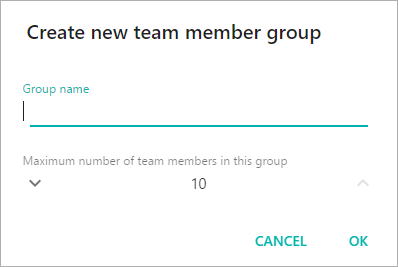 In the appeared dialog window, type in a group name and click OK. You can also set the maximum number of team members in the group. NOTE: Maximum number of team members in groups is limited by your Plan. The newly created group will appear above the team members list under Team member groups. Drag-and-drop a team member into the group. Click on the three dots ( ) button in the row with the team member name and choose Edit. In the appeared window, choose the desired group under Group name. To rename, specify custom attributes or remove the group, click on it, click on the three dots ( ) button at the top ribbon, and choose the appropriate option. If you don’t want to add team members one by one, the option of importing the list of team members is available. During import, you may either add new users to the Team or edit existing ones. Imported *.csv file should be in UTF-8. If the imported email is new for Slemma, then Slemma will create a new account for these team members and will add them to this Team as a team member. If the imported email already exists in Slemma but it is new for the Team, then Slemma will add this team member to the Team with the specified role and group. If the imported email already exists in a Team, then Slemma will update the role and group info for this team member. If an imported file contains the name of a new group for a Team, then Slemma will create this group in a Team and will place specified team members into it. If an imported file doesn’t contain info about group name for a new team member, then Slemma will add this team member in the group All by default. If imported file doesn’t contain info about group name for the existing team member, then Slemma will leave this team member in the current group. If an imported file doesn’t contain info about role of a new team member, then Slemma will assign this team member as Team member by default. If an imported file doesn’t contain info about the role of the existing team member, then Slemma will leave this team member with its current role. 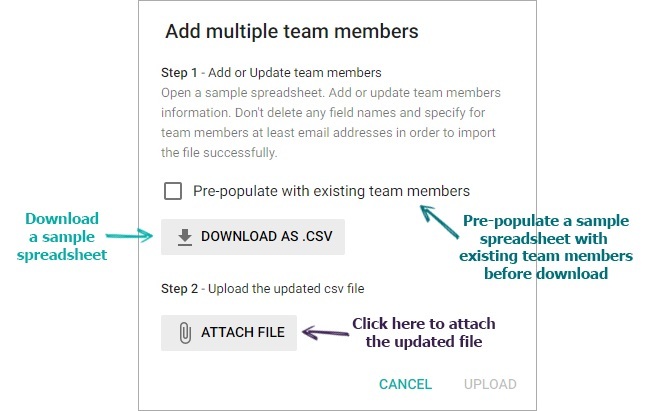 When the checkbox for Pre-populate with existing team members is selected, Slemma will download the list of team members currently displayed (e.g. if you are in the group, only team members belonging to this group will be downloaded). Bulk import won’t able you to remove team members from the Team. The Team owner is the person who has created the Team. A Team can have the only one owner. The owner has global admin permissions within the Team. cancel the subscription and thus delete the Team. NOTE: You can be the owner of the only one team, but a member of several. create and publish dashboard templates within the group. Thus, administrator has the same rights as the team owner, except for access to the payment and billing information. To invite clients to your Team, from the navigation pane, head over to the Admin page > Clients tab, click on the big plus button at the bottom right corner, and choose Add client. Type in email of a client (which you want to invite). Choose a group where you want to place the client (optional). Assign a role to the client (Client or Client group admin). Specify which objects the client will be able to create (by default all possible objects are selected). Each client will get an invite email. If they don’t have a Personal account yet, Slemma will create one. This is required to become a member of the Team. The whole list of clients is always displayed on the Clients tab. To create a new group, click on the big plus button at the bottom right corner and choose Create new client group. 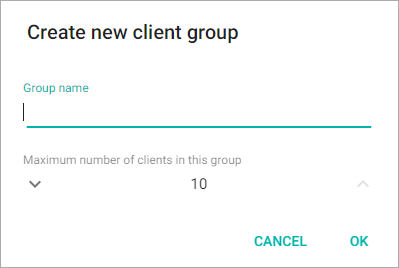 In the appeared dialog window, type in a group name and click OK. You can also set the maximum number of clients in the group. NOTE: Maximum number of clients in groups is limited by your Plan. The newly created group will appear above the clients list under Client groups. Drag-and-drop a client into the group. Click on the three dots ( ) button in the row with the client name and choose Edit. In the appeared window, choose the desired group under Group name. To rename, specify custom attributes or remove the group, click on it, click on the three dots ( ) button from the top ribbon, and choose the appropriate option. If you don’t want to add clients one by one, the option of importing the list of clients is available. 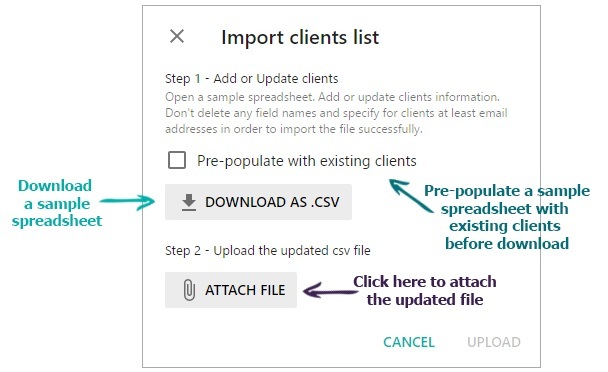 During import, you may either add new clients to the Team or edit existing ones. The same rules apply to when importing clients in bulk as well as importing Team members in bulk. 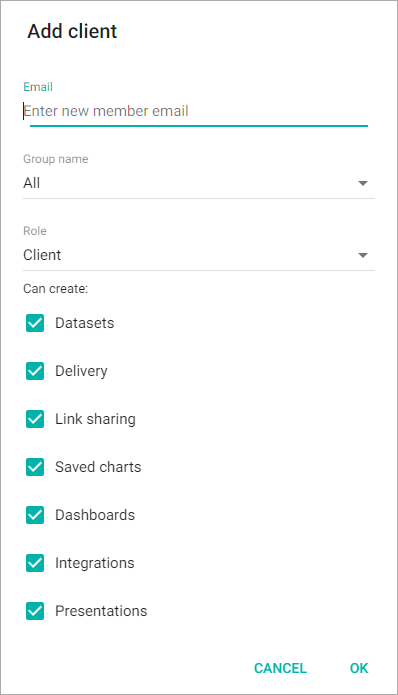 Clients can share objects within the clients group only where they are in, whereas team members can share objects to any team member or client. Clients can see only those objects that are shared personally to them or to their group, whereas team members can see objects that are shared to the whole team.